From custom built T-Tops, to saltwater fishing tackle, Custom Marine Fabrication and Sports has it all for New Bern anglers. Featuring an array of supplies that goes well beyond the realm of boating, this local James City area destination is a valuable resource for visitors who want to drop a line in the Neuse River waters, and beyond. Custom Marine Fabrication and Sports carries a full line of rods, reels, and tackle that’s designed for the saltwater fishing of the Inner Banks, and the friendly pros at the shop are happy to show newcomers how to use their new gear, and to help them select all the supplies they’ll need for a great vacation that’s filled with fishing. In addition to the fishing gear, the shop also features a number of kayaks for lengthy explorations, yeti coolers and other supplies, Costa Del Mar sunglasses that are ideal for the on-the-water sun, and many other items that will make any outdoor adventure a success. 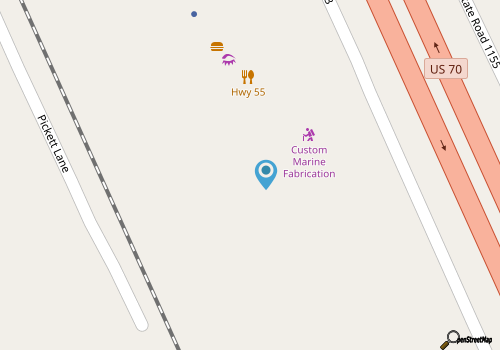 With friendly folks on hand who are happy to answer questions about fishing, boating, and other waterfront adventures in the New Bern area, visitors will find everything they need for an outdoors getaway at Custom Marine Fabrication and Sports. Call 252-638-5422 for current hours.